Altrincham Choral Society is a large mixed voice choir of around 120 singers and was established in 1945. We offer a diverse concert repertoire, vocal coaching workshops and concert tours, all in a sociable environment. 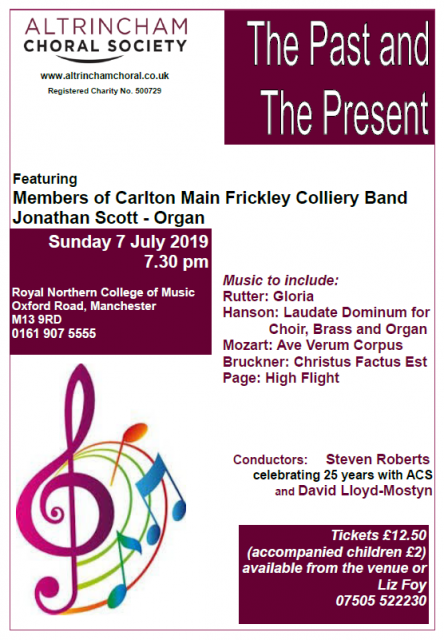 Our summer concert will feature members of the Carlton Main Frickley Colliery Band and Jonathan Scott on Organ. We are proud to be making a guest appearance at Lincoln Cathedral and will feature works from our Spring and Summer concerts.